I wonder how many of y'all reading this blog now were reading ten years ago when I attended my first Yom Kippur retreat at Elat Chayyim? I had felt for years as though Yom Kippur were eluding me. I could tell that it was supposed to be transformational, but I'd never been able to entirely find my way in. I always came out of it feeling that I wanted more. And then I went to the old Elat Chayyim for a Yom Kippur retreat, and the experience opened me up. It was everything I had barely dared to dream the holiday could be. From then on, I went on retreat every year for Yom Kippur, until midway through rabbinic school when I began serving others during the Days of Awe instead of going someplace to be filled-up myself. Read the whole thing: Yom Kippur at Elat Chayyim (2004.) And thank you, again, dear Reb Elliot and Reb Jeff*, for the immeasurable gifts of that retreat: gifts which are still unfolding for me in my rabbinate, my service, and my experience of the holiday even now. *In this case I mean Rabbi Jeff Roth, of the Awakened Heart Project -- not the other Reb Jeff, though I thank Rabbi Jeff Goldwasser for everything he taught me about high holiday prayer and leadership too. Also: if you have no plans for Yom Kippur and are in (or can get to) New England, there will be an amazing retreat at Isabella Freedman; read all about it. Or, if paying for a retreat is beyond you, you're welcome at my shul, where we do not have tickets; all are welcome. How can I begin to write about Reb Zalman? So many others knew him longer than I did. And so many others have written, and will write, about how his extraordinary life and work have shaped Jewish life today. I only knew his work for the last twenty years; I only knew him in person for ten years. Many of his students, colleagues, and friends spent a lifetime with him. Other people have written about him wisely and well, is what I'm saying. But his teachings and his life have been so foundational to my sense of what Judaism is and can be -- I can't let his passing elapse without writing something here. Writing is how I remember, and I want to remember him. Have you ever been around someone who -- the moment you enter into their presence -- you can just feel that they really have it together, that they're tapped into something deep? Reb Zalman was one of those people. I said last week that Reb Zalman is the reason I became a rabbi. And he is. I became a rabbi because I wanted to serve God and the Jewish people. But for many years I thought that was a yearning which would go unfulfilled. I found my teachers, my community, and ultimately my rabbinic lineage through Reb Zalman. And I found Reb Zalman through Rodger Kamenetz. In 1994, my dear friend David (who is now soon to be ordained a rabbi himself) gave me a copy of Rodger Kamenetz's book The Jew in the Lotus. The story it tells is a true one: about the delegation of rabbis spanning the breadth of Judaism and Jewish practice who went together to Dharamsala, India to meet with the Dalai Lama and answer his question of how the Jewish poeple had survived 2000 years of Diaspora. Reb Zalman's spontaneous davening in a Sikh temple had placed him squarely on the side of total immersion dialogue. Explaining to me later, he quoted from the Psalms, "I am a friend to all who respect you, O Lord." The Sikh guru and he are "in the same business, struggling to see holy values don't get lost. I see every other practitioner as organically doing in his bailiwick what I am doing in mine. When a non-Jewish person affirms me, I feel strengthened in my work. When I affirm a non-Jewish person, he or she feels strengthened in their work." Zalman also cited Isaiah's prophecy, "My house shall be called a house of prayer for all nations." ...I was electrified by his joyous crossing of boundaries, his davening chutzpah. It broke through my own neat categories. I associated Orthodox practice with insularity. Yet here was Zalman, making contact with another religion by davening maariv. I read that and I thought: holy wow -- his roots are so deep, and his wings are so broad. Elat Chayyim is every bit as fantastic as I remembered. When I arrived on Friday, I had this feeling of, "It's real! It's really here! I didn't make it up!" I walked around like I was in a dream. The first thing we did on Friday night was daven the evening prayers, and I was transported. I really, really like the way they think about prayer here. I like the melodies, I like how easy they are to learn, I like that the focus is on saying fewer words with kavanah (intent) rather than saying lots of words. I like their approach to God-language. I like how prayer services become a vehicle for learning new things. Saturday's classes were with Rabbi Miles Krassen. We studied a text by R' Schneur Zalman of Liadi, about teshuvah (turning/returning oneself toward God) and preparing for the Days of Awe. We covered a few interesting topics, among them ultimate reality, higher and lower levels of soul, the purpose of Yom Kippur, humans and angels, the views from different states of consciousness, the purpose of creation, transcendent God and immanent God, the true longing of the soul, Jacob-soul and Yisrael-soul, what it means that many religions have similar mystical teachings, the nature of mystical union, and how to prepare for Yom Kippur. Saturday night we had a short havdalah service (the service separating Shabbat from the rest of the week). I always love havdalah: the singing, the wine, the spices, the flame. Word had come that there had been another bombing in Israel, so we sang a song to awaken compassion in ourselves. We sang it in Hebrew and English; the words in English are, "On behalf of my brothers and friends/ on behalf of my sisters and friends/ let me ask, let me sing, peace to you./ This is the house, the house of God/ I wish the best for you..." I found myself wondering: what does it mean to "wish the best" even for those who hurt us? Is that even possible? I found myself weeping. After havdalah came more class; by the time we went to bed, my brain was completely full. So much to carry with me into Yom Kippur! R' Shlomo Carlebach sings "For The Sake Of My Brothers And Friends." If you can't see the embedded video, you can go directly to it at YouTube. 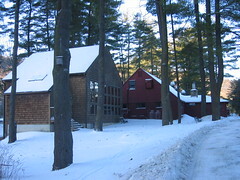 This Shabbat Shuvah retreat, back in 2003, was my second time at Elat Chayyim. There was something amazing about discovering that this community of passionate and committed spiritual seekers was still real, that I hadn't dreamed it up the first time I went. The awful news we mourned that night at havdalah was the Maxim restaurant bombing. I hope and pray for comfort for the families of the victims as Shabbat Shuvah approaches once again. I hope and pray for comfort for all who are impacted by cycles of hatred and violence, there and everywhere. Shabbat Shuvah means "Shabbat of Return," and the name is meant to evoke teshuvah, repentance / returning-to-God. That first Shabbat Shuvah retreat I attended was when I first learned to sing "return again, return again, return to the land of your soul" -- which felt, at the time, like a chant about returning to Elat Chayyim and to conscious community, but which also carries a much deeper truth. Shabbat, Shabbat Shuvah, Yom Kippur -- all of these are opportunities to connect with God, to make teshuvah, to re/turn to the place where we live out our highest aspirations and our hearts feel most unfettered and free. The main house at the old Elat Chayyim in Accord, NY. Seeing so many people in kippot startles me. In August of 2002 I went for the first time to Elat Chayyim, the Jewish Renewal retreat center which was then located in Accord, New York. (It has since become the Elat Chayyim Center for Jewish Spirituality at Isabella Freedman Jewish Retreat Center, but my first visit was many years before that change happened.) 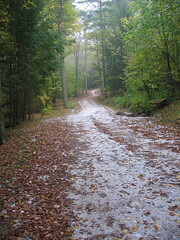 That week-long retreat was my first taste of Jewish Renewal outside of books. A first big step on what I didn't yet know was my life's path. On the Jewish calendar, that first retreat included the first day of Elul. That's when I learned the melody for psalm 27, Achat Sha'alti, which I still pray and sing and teach today. This year, we're about two weeks short of that Jewish anniversary. But on the Gregorian calendar, that first retreat began ten years ago today. The anniversary gives me a good excuse to remember that first retreat, and to reflect on these ten years I've been blessed to spend in Jewish Renewal community. 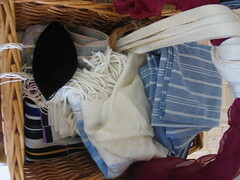 Kol Nidre is the only night of the year when we wear our tallitot (prayer shawls). Usually the prayer shawl is worn only for morning prayer. But Yom Kippur is considered by the tradition to be one long day filled with light. On this one night of the year, we don tallitot just before the Kol Nidre service (before evening has fallen) and we wear them throughout the day. We don't make the blessing when we don them again in the morning, because in a spiritual sense, it's as though we never took them off. We spend the whole night and day wrapped in holiness, enfolded in Presence. When we recite the vidui (confessional prayer), we can knock on our hearts ("anybody home? "), we can gently massage our hearts (to get them to open), we can tap harder to break what needs to be broken-open in us. Only we know what kind of knocking we need. On Yom Kippur we focus on all the places where we've missed the mark in the last year, all the ways in which we've failed to live up to who we know we can be. We ask ourselves: if this were the day of my death, if the work of my life had to stand as it is right now, through what would I be remembered? But at the same time, on Yom Kippur we are incredibly close to the Holy One of Blessing. The gates of repentance are open to anyone who approaches them with an open heart. There is an infinite source of love available to us, and we are always already forgiven. We just have to come knocking. I'm off to Elat Chayyim / Isabella Freedman today to spend Yom Kippur on retreat. Earlier in the summer I was sad that I didn't find a student pulpit within driving distance of home (my doctors would prefer that I not fly during my third trimester), but now that the chagim are upon us -- and now that I see where my energy levels are in week 30 of the pregnancy -- I'm grateful to have the gift of a holiday when I can sink into my own experience and do my own internal work. There will be many years ahead when I get to return to serving others during this time of year. Grab-bag of resources for Yom Kippur -- A post filled with resources for those who might be celebrating Y"K on their own, or who might want some personal/spiritual material for reflection to augment their more traditional observance. Thirteen ways of looking at Yom Kippur -- About my last Yom Kippur at Elat Chayyim, two years ago. Thirteen short thoughts / meditations on the holiday; I hope they add light to this solemn day. I wish all of you a g'mar chatimah tovah -- may you be sealed in the book of Life for a good year to come. It's always a little bit hard to explain why I so deeply love going to Elat Chayyim for Yom Kippur. The answer has something to do with what I feel when I first drive across the threshold: gladness, relief, gratitude that the place and its community exist and that I have been blessed to find them. 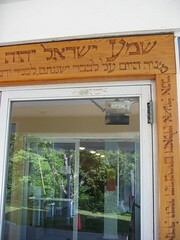 My first visit to Elat Chayyim was five years ago, at the old site in Accord, and I didn't know what I would find there. Ever since then, returning to Elat Chayyim feels like my soul is coming home. I'm off today for week three of DLTI! If you'd like to be reminded exactly where I am and what I'm doing again, here are a few previous posts on the subject: Week 1 of DLTI (written last summer, after the first week of the program); DLTI: 4 worlds, week 2, post 1 and DLTI post 2: gleanings (about the second week of the program, which was back in February.) I imagine I'll post something about the third week of the program after I get home, in the fullness of time. I don't expect to be online during the week of this retreat, so -- take good care of the internet (and yourselves, and each other), and I'll see you when I'm home again. Shavua tov / have a good week! Five years ago today I left for my first visit to Elat Chayyim. That's on the Gregorian (secular) calendar, of course; on the Jewish calendar that was the 27th of Av, and today is the 21st of Av, so we're off by about a week. Still, though -- by one reckoning, today marks five years since I first set foot on the Elat Chayyim campus. That was the old Elat Chayyim, housed in a former Catskills hotel in Accord, NY. I remember parking my car, walking slowly and a little bit uncertainly to the main building to check in, and wondering what exactly I had gotten myself in for and whether the place could or would fulfill any of the dreams and expectations I couldn't help having. That was before this blog began, so there's no record of my first Elat Chayyim week here in these pages. 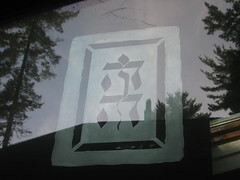 I spent mornings in R' Jeff Roth's Jewish meditation workshop, and afternoons studying tikkun olam with R' Arthur Waskow. 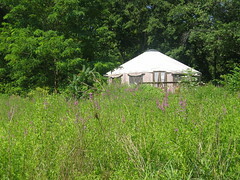 I had my first taste of weekday shacharit in many years -- this time, davening in a yurt, seated cross-legged on meditation cushions, learning chants that matched each of the basic morning prayers. (We had the option of choosing "traditional" or "interpretive" morning prayer. Today I enjoy both; but oh, I'm glad I chose the interpretive davenen then!) For the first time, I saw women laying tefillin, which was awesome and attractive and a little bit overwhelming. I had a lot of firsts that week. My first "mishpacha group" (a kind of ad-hoc family, a group with whom one processes the emotional roller-coaster of any week-long retreat), my first real conversation with God (walking in the fields and speaking quietly aloud, after the practice of Reb Nachman of Breslov), my first mikvah, my first Jewish Renewal Shabbat. I felt increasingly comfortable, at-home, luminous as the week went on. By the end of that week I knew that I had found my Jewish tribe, and that someday when I felt ready to work formally toward becoming a rabbi I wanted to do it with this community, because the rabbis who had led our learning and davenen all week were the kind of rabbi I aspired to be. Five years: that's all. On the calendar, it's a nothing, an eyeblink. And honestly, in lived time it doesn't feel like it's been that long. And yet. 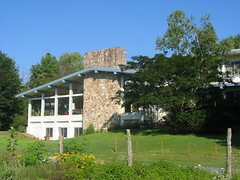 Tomorrow I'll head back to Elat Chayyim -- in its new home at the Isabella Freedman Jewish Retreat Center -- for the third week of DLTI, the two-year davenen leadership training program run by ALEPH. I've long since lost count of how many times I've been to Elat Chayyim; it is home for me now. And so is Jewish Renewal. I'm an ALEPH rabbinic student. Many of the teachers who first awed me during that first Elat Chayyim week are now beloved colleagues and, I hope, friends. I am -- baruch Hashem! -- on my way, learning how to live up to their example. When I stop to think about how my life has been changed by that first week at Elat Chayyim, it takes my breath away. I'm overwhelmingly grateful to that place, and to the people who enliven it -- hell, to Rodger Kamenetz for writing The Jew in the Lotus which sent me looking for Reb Zalman which brought me to Elat Chayyim which led me right to where I am. So thanks, everyone. It's been an incredible first five years. I can't wait to see what the next five will bring. When people ask, "so how was the second week of DLTI?" I'm not sure how to answer. The one-word response is "amazing," but that doesn't tell you very much, does it? So I'm going to try a four worlds response. I can answer the question on the level of assiyah, actions and physicality, by telling you that most of my colleagues made it to snowbound Elat Chayyim eventually (and that we deeply missed the few who couldn't be present in person), and that our days together were packed. We davened three times a day -- though on a different schedule than in summertime, because winter days have a different physical rhythm. Mostly this meant our days were denser. We still began and ended each day with prayer, but those dips into davenen happened closer together. Sun rises later, and so did we -- though we ended our days well after sunset, because there was just so much to do. Again, after each weekday shacharit (morning service) we re-opened the service in "lab" so everyone could learn from the experience of critique and re-creation. (Imagine live-action workshopping of service leadership: we weren't just discussing morning prayer, we were asked to immerse in it again in realtime even as we discussed it.) This time students led everything, even the davening on Shabbat. We built on what we learned last time about the matbeah (deep structure) of Jewish prayer. We began learning the Shabbat morning nusach (melody-system) and how it differs from what's done on weekdays. Any moment when we weren't actively in session, we were clustered around in small groups, planning the services which were yet to come. Thanks to an incoming winter storm, I'm off to DLTI a day early. Mike Landin's regional weather forecast predicts a potential snow accumulation tonight and tomorrow of 2-3 feet, maybe more. And for once, the storm isn't blowing in from the north; it sounds like it's coming from the south and east, which means that as I drive toward Elat Chayyim, I'll be heading right into it. I have good snow tires and a car I trust in inclement weather, but if we really get feet of snow -- well, I wouldn't relish being on the road tomorrow. (If I could even get to the road; our driveway is long and steep, and that sounds like the kind of snow that would keep me here until our plow guy shows up with his backhoe.) So I'm leaving tonight. I've been rereading my journal from week 1 of DLTI, and it feels like something that happened to someone else. I was so excited and energized and full of insights and teachings. We wrote b'samim notes, to help us preserve the sweetness of being there, and looking at mine now makes me laugh a little, ruefully, because it doesn't quite feel real. I'm excited about going back, and a little bit nervous. As always I hope to be open to what is, instead of getting stuck in my expectations (both positive and negative) about what might be. One way or another, it might be nice to have some extra time to decompress before the adventure beguns. Maybe I'll work on poems in the morning, or go for a walk in the snow. Once I get there, I'll be free until 5pm tomorrow -- it's like a gift of an extra day. Technorati tags: religion, Judaism, DLTI, elatchayyim. Happy (secular) new year, all! I hope everyone had as delightful and restorative a New Year's weekend as I did. Here's a neat way to start the year (at least, for me) -- the premiere of a new series of interviews in Zeek: A Jewish Journal of Thought and Culture. I get to have conversations with interesting people who are doing valuable, thought-provoking work, and then I get to shine them up for publication; what's not to like? We hope to run one of these every other month, so look for the next one in March; meanwhile, the first one has gone live. 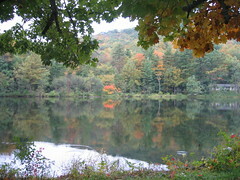 Picture the executive director of a retreat center. Specifically, a Jewish retreat center that, depending on who you ask, is either the heart of a transdenominational revitalization of Judaism or the kind of hippy-dippy groovy place that engenders eye-rolling. You're probably imagining a guy in his fifties, earnest but harried, maybe soft around the middle -- wouldn't be out-of-place at a Grateful Dead show, if there were such things anymore. Right? Technorati tags: religion, Judaism, Zeek. Once again, following in Hugo's footsteps, I've chosen my ten favorite posts of 2006. Unlike Hugo, I'm not ranking mine; these are in purely chronological order. Being visible "Tractate Kiddushin 31a of the Talmud says that the purpose of wearing a kippah is "to remind us of God, who is the Higher Authority 'above us'." Wearing a kippah makes me mindful, helps me bring blessing to what I'm doing, and reminds me to sanctify the work of my hands. Of course, an argument could be made that I'm always in God's presence, that I ought to bring blessing even to secular activities like folding laundry and buying groceries, and that every moment is worthy of sanctification. So why don't I wear a kippah all the time?" What makes a minyan? "Wherever ten Jews gather for prayer or for the reading of Torah, the tradition tells us, the Shekhinah dwells among them. (That comes from Psalms, 82:1.) Reading from the Torah scroll is one of the most beautiful and powerful liturgical acts in our repertoire, so it makes sense that we don't do it lightly. But surely the indwelling presence of God is among us even if fewer than ten are gathered; and surely one could argue that there is merit in a lenient policy which would allow small communities like ours to reaffirm our connections with (and derive blessing from) the presence of God manifest in the Torah service even on days when our numbers are few. So why be sticklers about needing ten?" The longest night "Imagine that someone fell ill suddenly, and was unresponsive by the time the ambulance arrived. Imagine one family member after another hearing the news and descending into grief. Imagine a burly priest driving in at two in the morning to offer the Sacrament of the Sick. Imagine the difficult decisions of organ donation and life support. Imagine the long crescendo and decrescendo of goodbyes. Imagine that the night went straight through 'til morning." A teaching from Philo, as retold by Reb Shefa Gold: We Jews love to eat. We eat all year long! And then we need a whole day of fasting in order to properly say the birkat ha-mazon, the grace after meals, so that we might truly feel gratitude and bless all that we have eaten. In this sense, all of Yom Kippur is one spontaneous upwelling of blessing. At the end of the Kol Nidre prayer, at the very beginning of Yom Kippur as the sun is just going down, we recite the words "vayomer Adonai, salachti kid'varecha," "And God said, I have forgiven you, as I have promised." The whole holiday begins with forgiveness. We're always already forgiven. We just need the 25-hour experience of the day in order to really feel that in our bones. "Avinu Malkeinu," sung to the melody I grew up with, is a waltz in 6/8 time. How did I fail to notice that all of these years? And there is absolutely nothing like chanting it with kavvanah (mindfulness/intent), in a room filled with fervor, with two excellent hand-drummers keeping us on our feet. The refrain to one of the prayers of the day ("Ki Anu Amecha") is "S'lach lanu, m'chal lanu, caper lanu" -- basically, "forgive us" said three ways. Reb David Ingber gave over a teaching from his rebbe, Reb Zalman, that we can understand these as follows: the first one says, "delete the files." The second one says, "empty the trash on the desktop of our hearts." And the third one is, "wipe the disk clean to make room for something new." When the brain and the belly burn from fasting, every moment a new song rises out of the fire. The mists clear, and a new vitality makes you spring up the steps before you. Don't give in to illusion and lose your power. But even when will and control have been lost, they will return when you fast, like soldiers appearing out of the ground, or pennants flying in the breeze. I especially love "Be empty and cry as a reed instrument" (which I can't help mentally reshaping into "Be empty and cry as a horn instrument," thinking of the wail of the shofar) and "Be empty and write secrets with a reed pen," which resonates for me as a hint of the ineffable way that poems can arise out of unknowing. 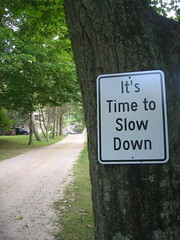 Tzom kal, everyone -- an easy fast to you, whether you're fasting just for Yom Kippur or during every daytime of Ramadan. May your observance bring you closer to the meaning that you seek.